Doctor Who writer Russell T Davies has suggested who he thinks should replace David Tennant as the next Time Lord. In e-mails serialised in The Times newspaper, Davies said Russell Tovey, who appeared in Alan Bennett's play The History Boys, would fit the role. The creator, who leaves the show next year as lead writer and executive producer, said he thought Tovey was "going to be huge" and is "amazing". Davies also revealed he had wanted JK Rowling to star in a Christmas special. 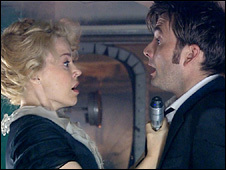 However, Tennant had not responded well to the suggestion. "David doesn't like the JK idea, he thinks it sounds like a spoof, so we've paused slightly, wondering whether to win him round or just abandon something that he's not going to be happy with," Davies said. A read-through with Kylie Minogue! Marvellous, isn't it? In the correspondence between Davies and Doctor Who magazine journalist Benjamin Cook, Davies talked about Kylie Minogue's cameo. "A read-through with Kylie Minogue! Marvellous, isn't it? She's going to watch Last of The Time Lords on Saturday with David. Madder and madder," he wrote. 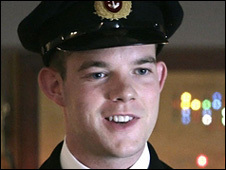 Tovey, 26, had a part in last year's Christmas Doctor Who special as Midshipman Frame. He is best known for his role as Rudge, the least intellectual of the boys in the stage and screen versions of The History Boys. The extracts are taken from a forthcoming book, Doctor Who: The Writer's Tale. They also reveal that Hollywood actor Dennis Hopper was keen to appear in Doctor Who, but was not "available for that many days" to film.